“I don’t think that situation is going to be resolved anytime soon. The French went in, nearly two years ago. They were claiming that their operation would only be for a few months and in fact now it’s approaching two years. This week returns listeners to the West African nation of Mali. Over the summer months however, the MNLA lost control of much of Azawad to the Islamist groups. 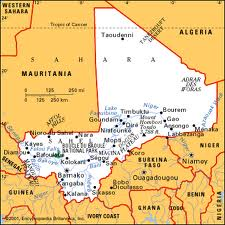 Following appeals for help from the Malian government, France sent forces down to secure the territory. They have maintained a force presence ever since. While Mali may have fallen off the mainstream media radar over the past two years, talks between the Tuareg rebels and the US-backed Malian government have been ongoing. The most recent round of talks in Algiers ended without a peace deal, stemming manly from the failure of the Malian government to comply with demands from the Tuareg groups for more autonomy in Azawad. With these developments, along with the recent announcement of more IMF loan guarantees to the Malian government,this week’s Global Research News Hour takes a closer look at the dynamics shaping the West African country with three guests. Abayomi Azikiwe is Editor of Pan-African NewsWire. He has written extensively on the topic of Western, particularly US, involvement in the African continent, and the principally foreign interests being served by the US troop presence there. Azikiwe looks at Mali in a geo-strategic context. John Schertow is the Winnipeg-based Editor and founder of Intercontinental Cry, an on-line magazine dedicated to reporting and chronicling Indigenous resistance struggles around the world. Schertow describes here some of the history of the Tuareg people and their claims to sovereignty in the African country. Finally, Bamako-based film maker Moctar Menta talks about the film project aimed at making the wider world realize the origin of much of the world they buy, namely, Artisenal gold mines extracted by children as young as 6! A detailed report of the situation is available here. People wishing to contribute to Intercontinental Cry during their fund-raising campaign should visit this site. People wishing more background on child-mining in Mali should visit www.minorminers.org.